At the heart of The Gastronomic Meal of the French lies the core value of caring about food and family and the power that joining the two through a shared meal has for bringing joy to our lives. The French tradition is to take care to learn from experts at the markets as one shops, to teach food preparation skills to those younger and less skilled, to share savoire-faire (know-how) for the staging, sequencing and pacing of a meal, to pair wines to elevate the experience once again and last but not least – to develop social skills to make the whole experience more enjoyable. According to the UNESCO website the gastronomic meal, “should respect a fixed structure, commencing with an apéritif (drinks before the meal) and ending with liqueurs, containing in between at least four successive courses, namely a starter, fish and/or meat with vegetables, cheese and dessert”. A lot of planning and prep goes into each meal of this caliber. 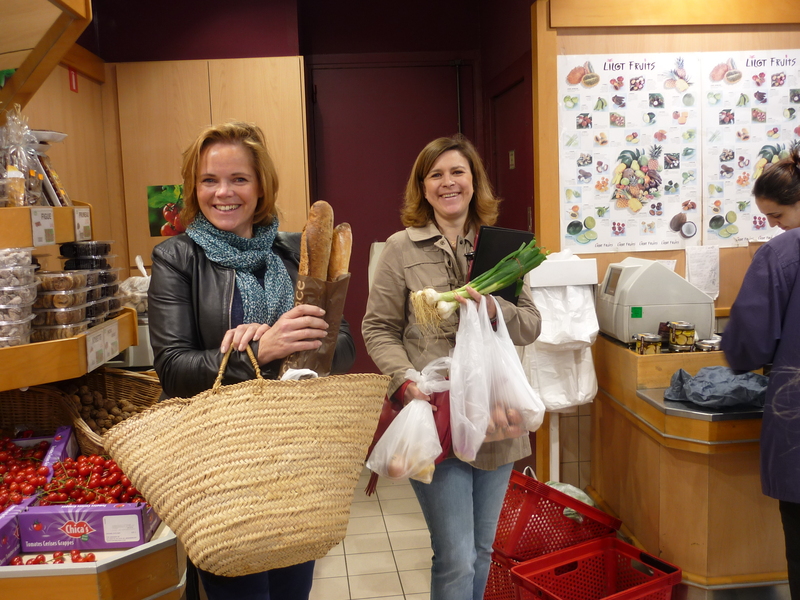 The French meal really begins with shopping. Shopping and choosing ingredients that are beautiful and healthy for one’s family and for the earth can be joyous. If you shop at big box supermarket chains that might be hard to believe but if you think about the times you visit a farmers’ market or smaller specialty stores where people are vested in your happiness and willingness to return, you’ll have to admit it’s a much more pleasant experience. Paris is a series of neighbourhoods – each with their own market streets. My friends live around the corner from theirs and shop daily. They know the merchants and the merchants know them and what they like. New studies show that people who buy less but on a more frequent basis, waste less. Marion and Aurélie are experts at buying exactly how much they need. An added bonus is, if you buy less, you can buy the best. Preparation is next. If the cook in the family is cloistered away doing all the work, knowledge and skills will never be passed down. Small kitchen or not, even sharing a few prep jobs with each meal will eventually add up to the passage of skills. Having children clean vegetables or set the table is a start. Chopping might come next. The fun of baking a favourite dessert or putting all the ingredients in a pot left to braise into glory are other tasks with built-in reward systems. Being given real responsibilities increases confidence. The apéritif is the time when the food is prepared and the table set and family and friends gather to relax and open their appetites. It is usually a light bite accompanied by a small amount of alcohol. Champagne is always a wonderful start. The food could be as simple as nuts, olives, or a little puff pastry palmier bought at the local bakery. My friends like to make big batches of mini savoury gourgeres (puffs of choux pastry) and keep them frozen to pull out and serve with a slight reheating. The starter course could be a soup, salad or other offering. On my most recent visit, we made a wonderful start with a shallot tart that was simple to prepare but that yielded complex flavours on the plate to savour and to satisfy. The main course is usually a meat or fish with vegetables. Spring lamb inspired an easy one pot braise of Lamb Navarin. Though the thought of a multi-course meal might seem a bit stuffy, in fact, for most families the Gastronomic French Meal is a casual and relaxing way to entertain each other and it is not unusual to get up from the table to help a bit between courses and to visit while the cook finishes preparations for each course. The cheese course is made up of three or four choices – a hard, soft, semi-soft creamy and perhaps a blue. For the French there is only Roquefort when it comes to blue. A basket of bread is always nearby for the cheese course. Dessert is the last course before liqueurs and petit fours (small treats from the oven) might be offered. Though my friends are great bakers and make fairly complicated dessert recipes – this is where most French hosts enlist the help of the many beautiful patisseries found in their country. Petit fours could be fresh chocolates, truffles or fresh little Madeleines or macarons that are purchased. The most lavish version I ever received in a French restaurant were at the Jules Verne in the Eiffel Tower. There’s a reason owner Alan Ducaisse is one of France’s most decorated chefs. He’s got “oh la la” down pat. The last notes on the actual French meal before we talk more about its significance is to remember to set the mood with some fresh flowers, candles and relaxing music. One of my dear Québécois friends always reminds me that whenever we turn the lights down and light some candles everyone takes a deep breath and relaxes. Its subliminal. While it’s tempting to think of the French Gastronomic Meal as a quaint throwback to another era and yet another ideal that’s impossible to achieve for most human beings, I think that what it represents is more important than any strict adherence to protocol. It’s what those rituals build into the lives of families that I think we can copy and enjoy. No matter where we live in the world we can agree that without cooking skills our physical health suffers and without the creation of opportunities for families and friends to connect our psychological well-being stagnates. I think holding onto the intangible cultural value of cooking and enjoying meals with family can go along way to improving and maintaining health of individuals and families. Since their acceptance of The Gastronomic French Meal to UNESCO’s list in 2010 the French government has launched “a TV channel dedicated to cuisine and culinary culture, introduced new programs in primary schools and opened a major museum center dedicated to the culinary arts of France and the world”. If British celebrity chef Jamie Oliver has his way, the United Nations will adopt food and cooking education for children in schools as an international human right. I think it’s time to stop thinking of cooking as a chore remedied by processed food produced by companies who started that idea as a marketing scheme to sell their products in the first place. My hope is that we’ll come full circle to see families invest in cooking and sharing meals as the opportunity for nourishment and joy that it’s always been. Skills acquisition peppered with the seasoning of a few good mentors will help make this a reality. We might not all end up making The Gastronomic French Meal but we can strive for the intangible cultural values it represents. Joy at the table will always help you savour it all. For those of you that would like to give the meal my friends Marion Willard and Aurélie Mahoudeau taught me to make on my visit to Paris you’ll find those recipes in the next post. For those of you who are overwhelmed by the thought of that, you’ll be delighted to know that the French are not always so serious about food. They’ve always loved their desserts and the latest trend for “Mug Cakes” is perhaps encouragement that though times are changing anyone really can learn to cook and make these delicious and fun treats. You’ll find a recipe for my homemade Chocolat-ey Chocolate Mug Cake here. Karen, this is a wonderful post. I am excited about food just reading it. I love the notion that we can gather and cook and socialize all at the same time, and that it can be joyous. And even nation building! It makes sense when you think about it Tandi. People who cook for themselves are healthier and live longer. So if you fill a nation with healthier people, that’s got to be nation building.